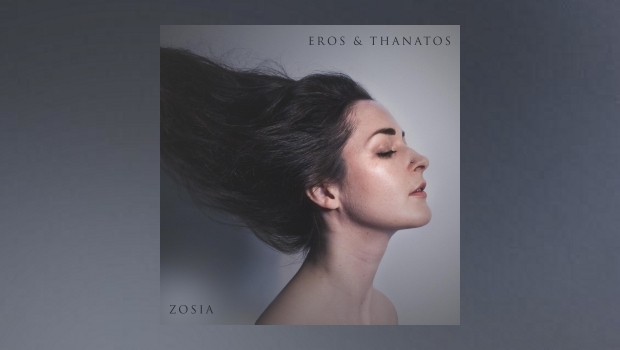 By way of an introduction to the creative world of cellist, pianist, multi-instrumentalist, singer-songwriter and poet, Zosia Jagodzinska, was the arrival of the all too brief Eros and Thantos EP. Zosia is a gifted, classically trained musician, who has expanded her repertoire into the jazz fields, whilst shaping and developing her own rather unique songs, created here by cello, piano, voice and percussion. Taking this on board the EP takes on a different hue as the music glides between the stark and melancholic to the sprightly and engaging, all magnificently captured by the two tracks that bookend the EP. The pensive desolation of Babcia is wonderfully portrayed in the string movement and oddly jarring textures created by the cello and Zosia’s haunting vocals. Babcia has an almost improvised feel, something perhaps picked up from Zosia’s forays into the jazz field, which adds to the pathos of the piece. In contrast First Breath which, for me, touched fleetingly on Norwegian singer-songwriter Ane Brun’s more quirky output, is an uplifting song with delicate punctuation between the piano and percussion. Wonderfully captivating and a perfect setting for the vocal melody – a song that brings a smile to the face. Nestled between are two equally engrossing tracks. He Sailed Forth holds on to the atmosphere created in the EP’s opener and particularly strong here is the tension created by the initial pizzicato strings, which are later replaced by more urgent bowed movements. The end result draws on Zosia’s classical training as the track comes to a dramatic and climactic crescendo. Release comes, in part, with Innocence, which is certainly no less compelling or dramatic, and perhaps best seen as a companion piece to He Sailed Forth, but lighter in texture – indicative of the track title. Wary of delving too deeply into the music here, suffice to say that it encompasses all the power and integrity of the EP as a whole. Eros & Thanatos is not an easy listen, but certainly one of great depth, which in a little over thirteen minutes, serves up a beguiling aperitif and promises much for the future.